Here we have a giveaway open worldwide for an iPad Mini. You have until the end of 8/4 to enter. 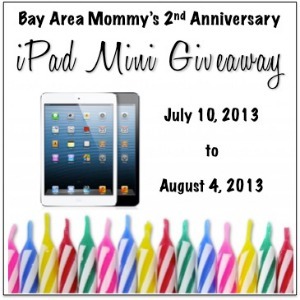 Good luck and congrats to Bay Area Mommy for hitting their 2nd anniversary. A winner won't be announced until the giveaway is actually over. People still have until the end of the day to enter. The host will then pick a winner, notify them, they'll typically have 48 hours to claim the prize. If they don't claim in time, a new winner will be picked, and so on. Feel free to contact Bay Area Mommy at the email in the Disclaimer if you have any concerns. The giveaway ends at 12 am EDT 8/5. Have patience. Feel free to contact Bay Area Mommy at the email in the Disclaimer if you have any concerns. I don't know where you see August 4th at 12 pm. In the text, it says August 4 at 11:59 pm, in the giveaway form itself, it says 12 am on the 5th. Even if it said 12 pm, it takes time to contact the winner and notify them that they won. They typically have 48 hours to claim the prize. Until they claim, you can't announce them as the winner because if they don't claim, they aren't the winner. In any case, I have no part of notifying the winner. You'll need to contact Bay Area Mommy who is hosting the giveaway. She'll be doing the notification and posting of winner.